A flexible and efficient packaging solution is a large part of the reason why German enterprise Voith Turbo H + L Hydraulic chose Hoyer to be their supplier. When the German manufacturer of hydraulic systems Voith Turbo H + L Hydraulic chose Hoyer to be their supplier of electric motors, their decision was based on more than just price and quality. The packaging of the motors was also an important factor. Ideally speaking, motors should be able to be transferred from the goods reception directly to the assembly line. At the same time, returning the empty packaging should preferably not entail high costs. “We were looking for a new supplier of three-phase electric motors for our production of hydraulic pump units. Hoyer’s product portfolio was exactly as we’d hoped; now the question of logistics had to be taken care of, too. 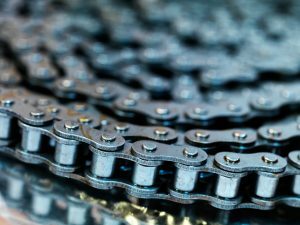 This was especially relevant, since we were unable to recycle our existing packaging system for logistical and economic reasons,” says Nico Lautenschlager of Voith Turbo H + L Hydraulic. Previously, a local producer delivered motors to Voith’s facility at Rutesheim near Stuttgart in moulded plastic crates. 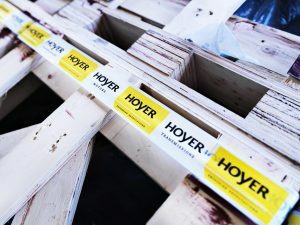 Now that the motors were travelling over a thousand kilometres from Hoyer’s warehouse in Denmark, it was essential that logistics costs were kept low – also with respect to returning empty packaging. And here, Hoyer’s flexible packaging solution based on the EU pallet was perfect. “The standard European pallet is the basis for this logistics solution. A number of spacers keeps the motors in place on the pallet and taping secures the consignment against damage during transport. The motors are further protected by pallet frames that can be adjusted to accommodate the height of the motor. Up to three motors can be transported on a single European pallet and several pallets can be stacked on top of each other. When the packaging is returned it can be folded so that Voith’s transport costs are kept to a minimum,” remarks Hoyer’s CCO Ketil Vesterlund. Besides practicality, there are also some environmental aspects behind this packaging solution. All pallets, pallet frames and spacers are made of wood and can be reused, with a service life in rotation between Voith and Hoyer of up to 18 months. This means the impact on the environment is far lower than that of the previous solution. The system can be used for various motor sizes and types because of the loose spacers used to hold the motors in place. Moreover, it is particularly well-suited to serial production, where speed and optimal procedures are vital. 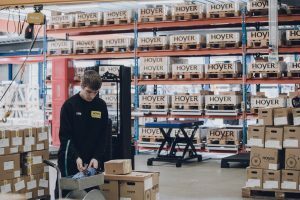 “We remove the frames on receiving goods from Hoyer and place them straight in the return store; the pallets containing the motors can then be sent directly to the assembly line. The work process is thus streamlined and we do not have to dedicate manpower to unpacking and preparing the motors first. Similarly, we optimise space requirements in the goods reception,” explains Lautenschlager. Part of the Voith Group. Voith is one of the ​​largest family-owned businesses in Europe with a turnover of EUR 4.3 billion and 20,000 employees in over 60 countries. Of these, around 200 work at Voith H + L Hydraulic in Rutesheim, Germany. Voith Turbo specialises in hydraulic units, couplings and brake systems for use in roads, railways, industrial and maritime propulsion systems.